Strong and Active guild looking for 3 members to fill out spots . Friendly helpful guild that will help your squads grow to their maximum potential and be a fun place to chat and meet like minded nerds! Level 85, no GP requirements, experienced players to help you develop, We just ask that you stay active and committed. Message me here or discord (Mightydohboy#9353) if you have further questions. The Notorious Separatists and Griffintown Scoundrels need a few good members! NS is a 70 million GP guild farming Hpit and Haat with a few rules to make everyone happy. Discord and 1.5 million GP required. GS is a casual guild running Hpit and Naat with very few rules. No discord required and new/low GP members welcome. Wanting to add 2-3 active players to replace those not able to keep up with the rest. 128m+ and have the greatest Discord server around. All the best YouTubers are there with us. The Outer Rim - RECRUITING NOW! We are a family of 17 guilds ranging from beginner guilds to 125mil+ Heroic Sith Raid focused guilds. A large online community of over 600 members, access to a variety of game resources, and a veteran leadership team hell-bent on providing an optimal gaming experience for every level of player! Each guild creates its own destiny, with the support of a dedicated family community to help each member succeed at any level! We have an eclectic mix of US and EU members, with Raid Times, Guild Resets, and Specific Guild Requirements that vary per Guild. Literally, something for everyone!!! Stop by for a visit, a chat, a beer, or just to say hello! Our recruitment team is available 24/7. We currently have openings at all levels, so now is the time! You know you’ve always wondered what life was like in the Outer Rim - JOIN NOW!!!! Hiya! HeroOS from Scoundrel Federation here. We are currently accepting 1-2 players (We might be able to make more room depending on your squads and contributions, since we have a few underachievers). We are very friendly, talkative, and welcoming. We’re here to have fun, get top-tier rewards, and help each other become better players. We are fairly close on our own to completing an HSith raid. We’re looking for competitive players who will push us over the edge of completing it, and stick with us if it takes a few tries to complete. We understand that people have lives outside of the game, so it’s ok to be gone for a few days or to be under 600/600 every once in a while. We keep up and monitor contributions to make sure everyone is doing their part. Primarily EST, CST, and MST guild with a few Europeans and Australians. We look forward to you joining us and becoming a fellow Scoundrel! 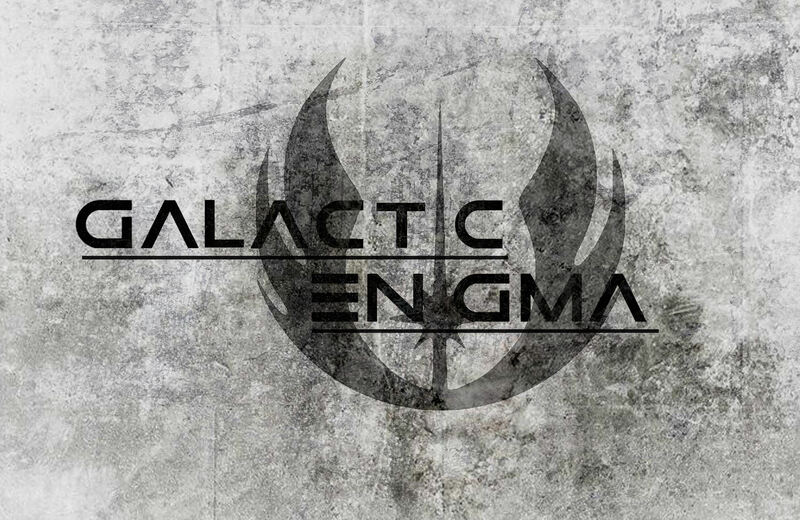 Galactic ENIGMA is now recruiting three players to fill our ranks! We are a 72mil GP guild that is farming Heroic Rancor and Heroic Tank, so come get your Han Solo and General Kenobi Shards! We are also very excited about Territory Battles as well as Territory Wars AND are starting to build squads for Sith raids! Things that we are looking for from you: Discord, a swgoh.gg account, lvl 85 and at least 1mil GP, active in all guild events, like to chat. Please come to our Discord server(link below) and an officer or myself will help you! Raids: We are farming Heroic Rancor and HAAT. All Rancor launch times are Noon PST. HAAT raids are set on a rotation. We also have a 24/0 damage rule on both Tank and Rancor Raids so that everyone may benefit! Sith raids are launched as soon as the previous one is completed. We are currently farming T4 until we can drop it in less than 24hrs at which time we'll move up to T5(and we are actively building teams to improve)! Territory Battles: All TB strategy is coordinated in a separate channel in our Discord server and efforts are focused on getting the most out of TB possible, shards and currency both. We have also added an additional officer to help with the extra leadership load TB has added! Territory Wars: We are committed to winning in TW and have thus far only suffered two losses, one of which was a very close(and exciting!) battle. We want everyone to succeed and are constantly looking to improve on what we're doing to help all members. SO, come and join now! SΞN Shards of Alderaan is currently looking to fill 2 slots in our friendly and active guild. We are at 100mil GP 37LS TB stars and 40DS TB stars. Participation in Territory Battle and Territory War is a must and active listening for TB/TW on discord. All applicants must provide SWGOH profile and you will get a response ASAP. HPit 3x a week. HAAT 2x a week. 24 hour 0 damage rule for both. Doing tier 4 Sith raid at the moment. Looking for active players who are 1+ mil GP or close. Discord is mandatory. Message me on here or discord. Primal Alliance is looking for a few good men. We're a 66mil gp guild that raids hpit 3 times a week and haat 2 times a week. We alternate STR on tier 3 and 4. We do well in TW (guaranteed zeta) and 26* LSTB. We use LINE and its mandatory for strategy, instructions, and general chatter. We encourage 500 daily tickets. Our reset time is 130pm eastern US. Our raids are 2 and 5pm est. Most importantly, we're a drama free bunch of good guys who have a good time playing the game and encouraging each other to kick ****. We're from all over the states, europe, and even reaching into asia. PM and if we're a fit, join us. I'm @Buddha-Fett on LINE. UTD Red is friendly, family-style relaxed guild with a passion to help others and are mainly based in Europe (English Speaking). We do our best to accommodate a wide-variety of schedules. Our guild reset is 18:30 GMT. We are at 71 million GP and are at 49 members currently. - The rancor is regulated by a 24 0dmg rule followed by FFA. Soloers have to wait 30 minutes to post from FFA start. Every other raid will be an 'alternate' raid whereby only members without 7* Raid Han are allowed to participate with the rest with 7* Han only posting 0. This allows our lower level members to get their Han to 7* quicker. - The Tank raid has P1 and P2 open at launch but P3 and P4 don't open until 24 hour mark. The tank raid also follows the same 'alternate' raid system as the rancor for the same reason. - Currently we are doing T4 of the sith raid and complete it in about 5 refreshes. We are working towards higher tiers and expect to get their soon. - We have a coordinated system for platoons to maximise our results using swgoh.gg spotlight search on characters. - We have a complex strategy on coordinating our defensive strategy and we expect our members to set 5 defensive teams and attack at least 3 times if they choose to participate. We are currently on a 4 win streak and we do analysis post TW that shows individual performances of players. We don't have a 600/day requirement although its highly encouraged and we usually reach 26k a day. We also recognise that people have lives and understand if you need a day off for whatever reason though we ask if you keep us informed. We are using discord for communication. Contact me on forum or DM at discord - Armatores#6958 if interested. Kashyyyk's Forgotten are looking for new members! Members who are active on a daily basis, eager to learn, grow and help others. We are ideally looking for members who are 500k GP and higher but may make some exceptions on a case-by-case basis. 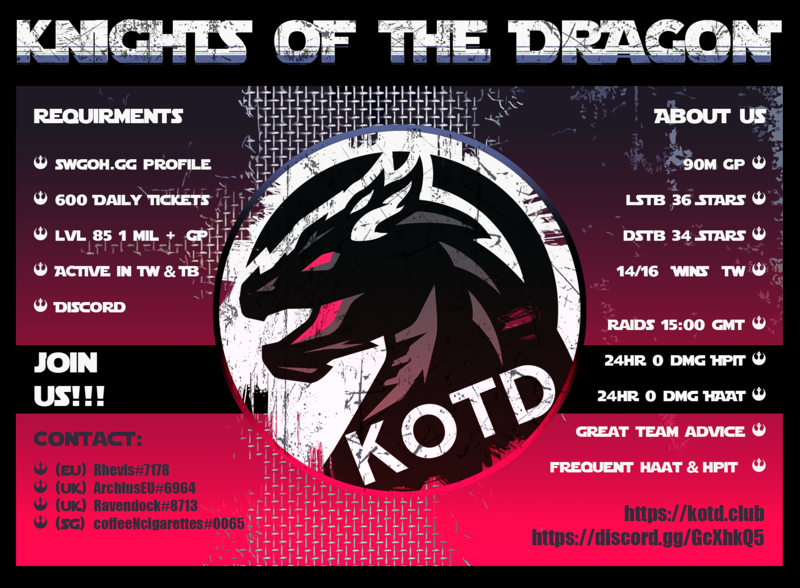 If interested feel free to message me here or on discord (Tango Fox#2223) we look forward to hearing from you! We are looking for active players for our entry level HAAT and T4/5 sith raid guild. (68-70m GP) We are looking for Players who want to learn and join our online community. We have several guilds that you can move up to once youre ready, we have 3 guilds that are completing Heroic Sith. We have a knowledgeable and fun community on Discord, come join the family! Membership requirements: All levels welcome. Contribution toward daily guild activity and coins required. Looking for active members who can help contribute to raids. Higher membership will help us increase raid frequency and tier so we can get more and better gear to members. Members who can do raid damage in the millions will be near the top of the guild for raid payouts. We launch a raid every single day and always have a sith raid going. To apply contact me via discord or line. Looking for 3 STRONG players - we have 47/50 members right now - must be active and join our discord server. We are a causal but committed Guild. We are currently looking to rebuild our guild. We do heroic pit raids as often as we can; at least weekly, trying for 2x week. We are still working toward HAAT. We prefer daily, active playera that will get their daily 600, but we also know that we have lives outside of thia game. -Have fun! No discord associated with guild. at the Viscious Crew guild !!! Members who are active on a daily basis, eager to learn, grow and help others. We are ideally looking for members who are 400k GP and higher but may make some exceptions on a case-by-case basis. Independant HAAT 90 MIL GP guild looking for more players, discord required. Running HPIT raids 3 times a week, HAAT 2 times a week. All raids starts 4pm GMT, 11am CT, 11pm SGT. 1) 600 tickets per day. Looking for 1.5MM GP working towards HSTR. We have 9 JTRs and will be getting another 12-15 next time. Check out our swanky flyer and swgoh.gg account. Monkeybrains is looking for you!! 56 m gp. We have a great core group of 35 players. Guild has 47/50 total. Both heroics whenever tickets allow. T4 sth. 22 plus stars in Tb. 13 wins in tw so far. Guild has worked hard to get where it is today. We want to keep growing. Come join and work towards heroic sth with us. YOUNGSTOWN is looking for a few good players. We are a friendly and helpful guild with members all over the world. We are always willing to help if needed, and love to communicate both for the game and just for fun too. -Sith raid t4/t5. Looking to move to t5 permanently. -We have discord but do most communication on kik because it's more fun to use. Swindling Scoundrels is a very active new guild looking to fill up its roster. We are all active players between 1mil and 2mil GP who left their casual guild to progress faster and be competitive in Territory Wars. If you're in a similar situation and are looking for a guild to share info, joke around and get the satisfaction of progressing as a group, join us! We still have room, so you can bring current guildmates with you. We have a great vibe going and we're looking for like-minded players to join us. We want participation in all the raids and guild event, but we are also pretty chilled and won't kick you out for going on a holiday! We use Discord for guild communication. At the moment we are looking for a few players, ideally in the 2.3M+ GP range (negotiable), that work/willing to work towards Imperial Troopers, Chex Mix, and Night Sisters squads. JTR is a plus. If you are interested, please message through here or aliux12#6646 on Discord. 17-4 TW record ranked in the 700's out of all guilds. We just want active players 600 tickets and are active. No Stress guild HAAT and HPit on quick farm. STR being farmed for max guild currency and gear T4 and T5's to maximize tickets. 21/50 Players at the moment, more to come. Guild GP is 45mil because we are currently merging with other guilds. As stated before, we are currently merging guilds and are in an awkward in-between at the moment so please be patient.